These Lemon Macaroons are bright with lemon flavor, with a touch of maple sweetness and a deliciously chewy texture. The tart lemon glaze is made with coconut butter. You’re going to love these irresistibly scrumptious gluten-free, paleo, and vegan macaroons. I don’t make enough lemon desserts…they’re something my mom has always wanted more of, and I’ve always resisted since historically, I just don’t really like lemon desserts. When I want something lemony, I want it super bright and tart with lemon flavor, and usually, lemon desserts are just too sweet for me. As with most of my treats, I kept things relatively simple with these beauties and the result was simply fabulous. You don’t need a whole lot of ingredients to make good treats, guys! Only eight ingredients are needed for both the macaroons AND the glaze. 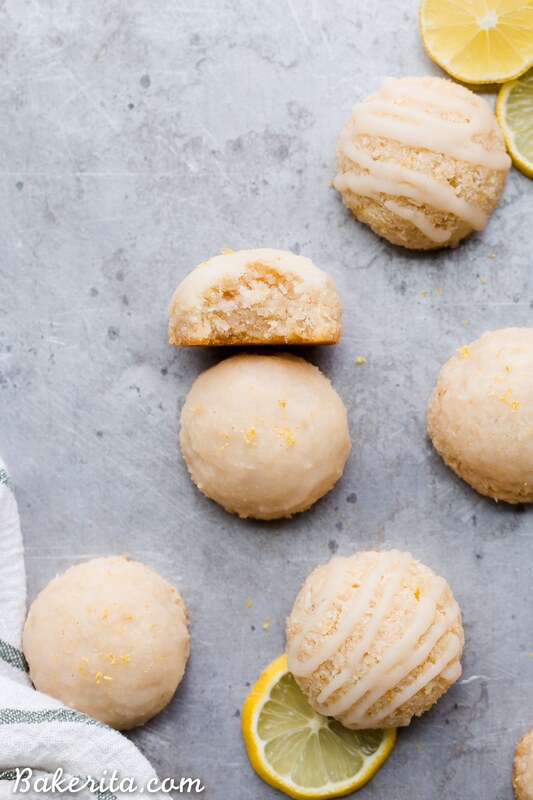 Lemon Macaroons with Lemon Glaze…yes, please! Now let’s talk about what’s in there to make these lemon macaroons so chewy, sweet, tart, and wonderful. Of course, you can’t have coconut macaroons without coconut. I use a very finely shredded unsweetened coconut (also sometimes called desiccated coconut) that helps these hold together nicely. There’s also a bit of almond flour and a pinch of salt. Maple syrup adds sweetness and coconut butter helps bind everything together. 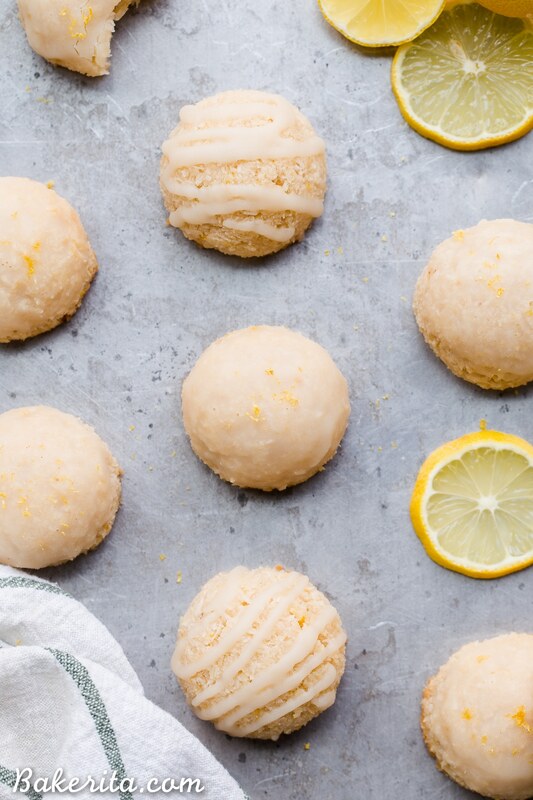 A splash of vanilla extract, along with the necessary fresh lemon juice and lemon zest, add a bold brightness when you bite into the macaroons. Heavenly! Can’t forget about the glaze either – it’s equally simple and lemony, and when paired with the macaroons, we get the perfect level of tart sweetness. In my opinion, the glaze is super necessary to add that tartness that I crave in a lemon dessert. Because it has a coconut butter base, it firms up so nicely and carries the lemon flavor deliciously. 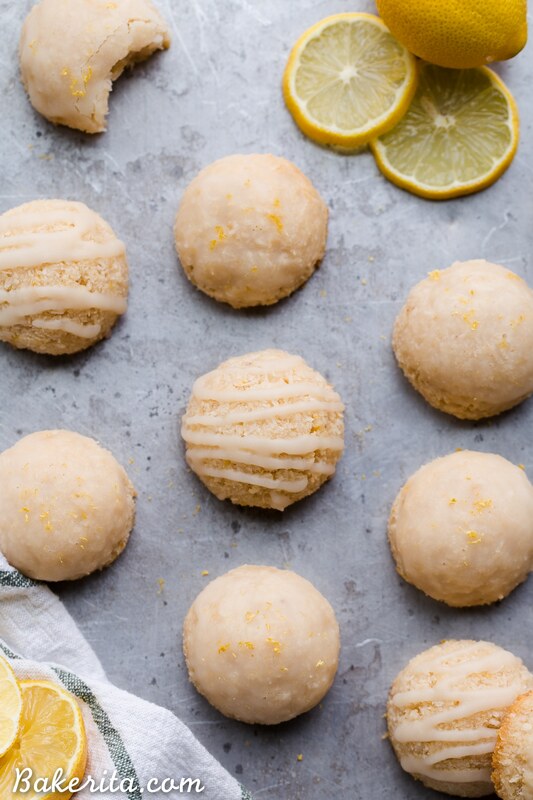 If you’re a lemon lover, then you’ve GOT to try these…and if you’re not, you should still try them, because maybe they’ll be the treat to change your mind  they’ve got that classic coconut macaroon chewiness infused with the brightness of lemons – it’s truly irresistible. Enjoy my friends! 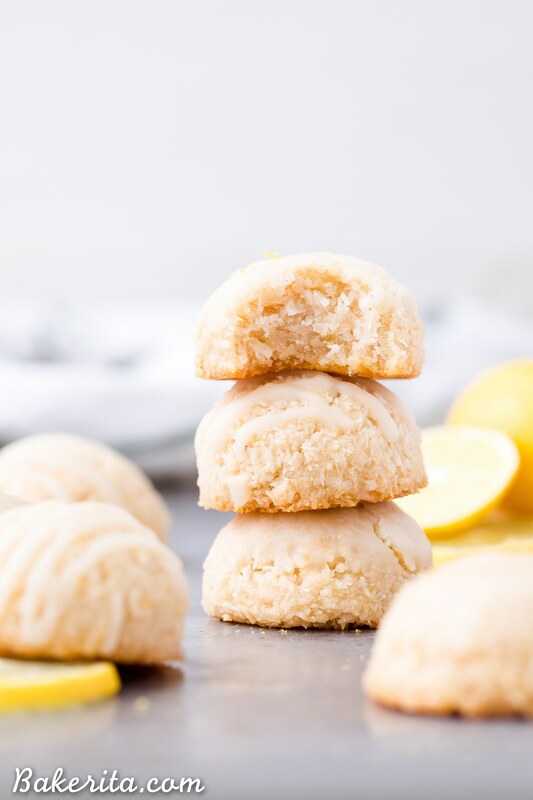 These Lemon Macaroons are bright with lemon flavor, with a touch of maple sweetness and a deliciously chewy texture. The tart lemon glaze is made with coconut butter. 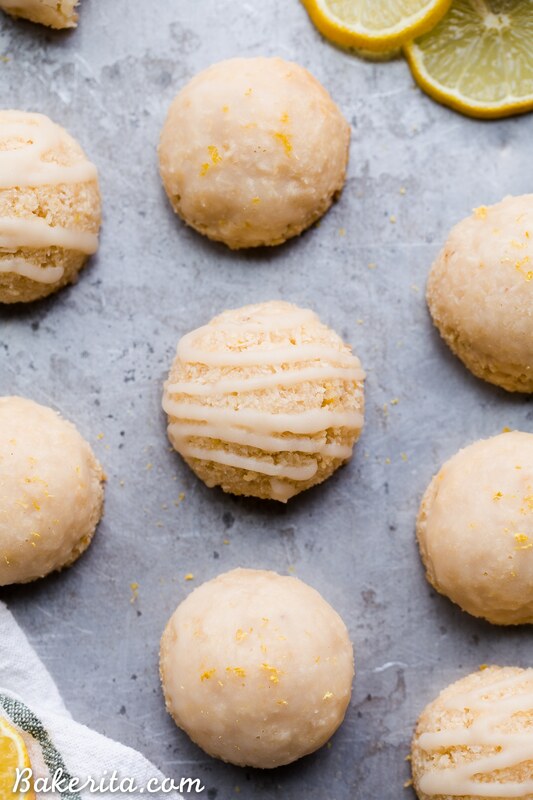 You're going to love these irresistibly scrumptious gluten-free, paleo, and vegan macaroons. In a large bowl, stir together the almond flour, shredded coconut, salt, maple syrup, melted coconut butter, vanilla extract, lemon juice, and lemon zest until thoroughly combined. With a small cookie scoop, scoop the dough and pack it in so the top is flat and then release onto the baking sheet. Repeat until you’ve used the rest of the dough, spacing the macaroons evenly on the baking sheet. They won’t spread, just puff slightly, so they can all go on one. Bake for 20 minutes, then rotate the pan and bake for 15 to 20 minutes more, until the macaroons are golden around the edges. Let cool on the baking sheet for 10 minutes. While they’re cooling, prepare the lemon glaze: in a small bowl, whisk together the coconut butter, maple syrup, and lemon juice. Whisk in 1 tablespoon of the melted coconut oil, until smooth. If the glaze seizes up at all, whisk in the remaining coconut oil until smooth (or just to thin it out to your desired consistency). Once the glaze is prepared, dip the top of the macaroons down into the glaze, letting the excess drip off, and then place back on the baking sheet to set. Alternatively, you can put the glaze into a ziplock bag, snip the corner, and drizzle it on. Garnish with lemon zest, if desired. Once the glaze has firmed up, store leftover macaroons in an airtight container in the fridge for up to 1 week. You can place them in an airtight container or freezer-safe zip-top bag, and freeze for up to 1 month. I’ve never made macaroons before…but this recipe is convincing me to try!! YUM. What if u don’t have coconut butter? Hi Tracy, oh no, so sorry you had trouble! My dough was definitely on the thicker side, they totally hold their shape as a dough. Did you use the right kind of finely shredded unsweetened coconut? Using a larger flake would probably make things runnier. These are addicting! I also did a batch swapping in a cara cara orange for the zest and juice. Today I made another with cocoa and more coconut manna to add moisture. Delish! Oh, love the cara cara orange version! So thrilled you’re loving these, Kim :) hope you find so many variations you love! I Rachel! Love this recipe idea & want to try this for sure. Questions: How strong is the ‘coconutty’ flavor in the end product due to the coconut butter? Can cold refined coconut oil be subbed? Thanks! Hi Judy, coconut butter and coconut oil are pretty different and the coconut oil would just melt, while the coconut butter provides structure, so I wouldn’t sub one for the other. I love coconut so I don’t know if I’m the best to answer, but I don’t find it overwhelmingly coconutty – but there are a lot of coconut products in here, so you can taste it. Hope you give them a try and enjoy! Hi Rachel! This looks amazin! Can you replace the almond flour with coconut flour instead? thanks in advance! Coconut flour is much more absorbent than almond flour so I would never recommend switching one for the other – best to stick to almond flour or another nut flour here. Enjoy! Wonderful, so happy to hear that Allana! Thanks so much for the feedback.